Fuduntu is a Fedora remix designed for netbooks and laptops (but works on a desktop too) that integrates a lot of very interesting tweaks. Check out our previews Fuduntu posts for more info. Fuduntu 14.9 stable was released today and it now features Avant Window Navigator by default which is automatically adjusted based on your computers ability to run Compiz. 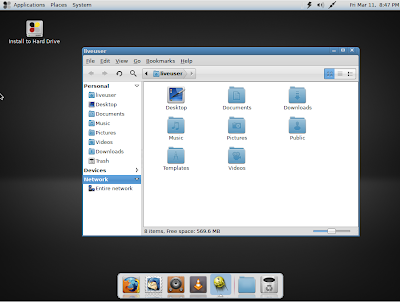 But if you want to use the regular Gnome panel instead, Fuduntu provides a tool that automatically restores it - simply go to System > Preferences > Bottom Panel Chooser and select "Restore my bottom panel". Further more, when you first run Fuduntu 14.9, your computer is tested if it can run Compiz and if so, Compiz is enabled. The artwork was also updated and Fuduntu now ships with quite a few new wallpapers. The first time you log in, your wallpaper will be chosen automatically from one of these wallpapers. The Fuduntu repository now provides the latest stable Adobe Flash, Chromium (9), VLC or OpenShot. For a complete list of changes in the latest Fuduntu 14.9, see the release announcement on Fewt's blog. 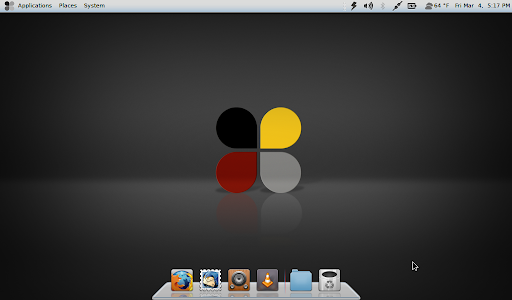 Download Fuduntu 14.9 (available for both 32bit and 64bit).